We’d love your help. Let us know what’s wrong with this preview of A Mind of Her Own by Paula McLain. To ask other readers questions about A Mind of Her Own, please sign up. Hate to say it, but I felt letdown by A Mind of Her Own, an Audible original about Marie Curie. The description and short length initially intrigued me, however, it did not hold my interest like I hoped it would. I thought A Mind of Her Own would be the story of Marie Curie, a smart, independent, academic woman and her accomplishments. There were traces of that storyline here, but not nearly enough. It turned to the theme of love, and was not a compelling love story, to me anyway. I feel like th Hate to say it, but I felt letdown by A Mind of Her Own, an Audible original about Marie Curie. The description and short length initially intrigued me, however, it did not hold my interest like I hoped it would. Interesting, but it seems to defeat its own message. Throughout, the message is about Marie’s equal or greater ability compared to men and her intense dedication to her work, but the whole piece is written around her romance with Pierre, completely reducing her to a love story and not at all reveling in the amazing advances she made. I came for the science and a short biography, not a love story. One of my Audible Original selections for March 2019, A Mind of Her Own is the story of Marie Sklodowska as she was during her studies at the Sorbonne in Paris. During Marie's youth her home country of Poland was overrun by Russian rule and women were barred from post secondary studies. So France was the dream destination for a woman who was fascinated by the new theories in Science and technology. Paula McLain shows us that Marie was a formidable forward thinking woman who believed that women could be whatever they wanted. But nothing prepares her for the pursuit of a young man named Pierre Curie who wants nothing more to work with and capture Marie's heart. Eh. Not my favorite. It was a surface-level love story. The intelligence and achievements of Marie Curie were secondary to the focus of this relationship with Pierre. The faux-accents throughout the audiobook were very distracting. I just couldn’t get into. Because of the short nature of this piece, there wasn’t enough depth to build any emotional connection to the characters and the storyline was too choppy to follow along with. Unfortunately, for me, I had to stop listening. In a nutshell--don't waste your time on this even if it is free. Look at the title--A Mind of Her Own. Do you see the so very popular feminist angle being promoted? The novella has a feminist tone with an added love intrigue. Look at the first sentence of the GR book description: ”From Paula McLain, the best-selling author of The Paris Wife and Love and Ruin, comes a breathtakingly intimate story of the brilliant, willful Marie Curie - a young woman in Paris on the verge of her greatest discovery In a nutshell--don't waste your time on this even if it is free. Look at the first sentence of the GR book description: ”From Paula McLain, the best-selling author of The Paris Wife and Love and Ruin, comes a breathtakingly intimate story of the brilliant, willful Marie Curie - a young woman in Paris on the verge of her greatest discovery yet: herself.” We are to swoon when Pierre kisses Marie. What is delivered here is a mini-romance novel, one cursorily drawn. Marie Curie’s character, her background and her upbringing are covered in a line or two. Don’t expect to learn anything of consequence about Marie Sklodowska Curie, her husband-to-be, Pierre Curie, or their revolutionary pioneering research on radioactivity. There is nothing here on her scientific discoveries. This mini-novella reads as a preliminary sketch for the beginning of a novel of historical fiction. The prose and the dialog need to be improved. Some of the metaphors are utterly dreadful. This remains an unfinished, incomplete product. Hillary Huber narrates the audiobook. Her narration is OK—you hear what she is saying, but she reads at an uneven pace which diminishes rather than enhances comprehension. The least interesting thing (to me) about Marie Curie is how Pierre went about courting her… Just saying. Paula McLain's _A Mind of Her Own_ receives four stars from me due to the lovely narrative skill, and the wise choice in subject matter. First, since this is an Audible recording, a comment about the reader. Hillary Huber is the reader for this text. She has a good voice, and narrative skill. I think her interpretation was excellent. I'd listen to her again. She did a few small accents and that added to the experience. Second, the story and author. I'd like to know what McLain is basing this text Paula McLain's _A Mind of Her Own_ receives four stars from me due to the lovely narrative skill, and the wise choice in subject matter. Second, the story and author. I'd like to know what McLain is basing this text on. I believe it is historical fiction, or maybe historical non-fiction fiction, but did she read diaries, etc? I'd like to know because I'd like to know how much is true and how much is author elaboration. Why do I want to know this? The story is compelling and since it is based on a real person and a real relationship, it would be nice to find out how much elaboration there is. Third, I notice other commenters stating that it is too short. Oh it is short and in many ways, I agree with them. It would be nice to go on the journey of their relationship and see exactly how Pierre's idea of sharing the work was actualized. However, I think McLain has made a wise choice in focusing the narrative on just the beginning of their relationship, and how it got started. There is a short flashback that explains some of her family life back in Poland, and this is great for this text. It is focused enough so that we know about her life, yet not too long so it diverts the attention on the topic. Absolutely, there is interesting material for McLain or another author to run away with, giving details of life in Poland, etc. However, I enjoyed the length. I think for someone who doesn't know much about her, this is an excellent introduction. Unfortunately, this book was missing all the things I was so hoping to learn about Marie Curie. I truly enjoyed this author's The Paris Wife, but this story seemed more like a vignette and not truly a book that gave us knowledge and details about Marie. Sadly, it is not one I recommend. 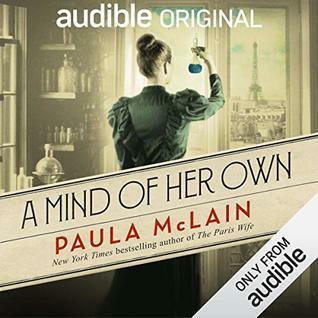 One of my Audible Original selections for March 2019, "A Mind of Her Own" is the story of Marie Sklodowska as she was during her studies at the Sorbonne in Paris, and when she meets her future husband Pierre Currie. Ms. McLain is a well-known historical fiction novelist, so I know many people were excited about seeing what she would do with this subject matter. Madame Marie Currie is probably the most well-known scientist in world history. There is no denying that her subject matter and writing One of my Audible Original selections for March 2019, "A Mind of Her Own" is the story of Marie Sklodowska as she was during her studies at the Sorbonne in Paris, and when she meets her future husband Pierre Currie. Ms. McLain is a well-known historical fiction novelist, so I know many people were excited about seeing what she would do with this subject matter. Madame Marie Currie is probably the most well-known scientist in world history. There is no denying that her subject matter and writing style are compelling; I was hooked just by listening to the sample. A big part of what makes this book is the narrator. Hillary Huber, the narrator for this Audible Original recording, has a good voice and pretty good narrative skill. She did a few small accents and that added to the listening experience. I wouldn't mind listening to her again. I noticed other commenters, on Audible and Goodreads, stating that this audiobook is too short. Oh it is short and in many ways, I agree with them. Personally, I would have liked if this book would have been a novel. It would be nice to go on the journey of their relationship and see exactly how Pierre's idea of sharing the work was actualized. However, I think McLain has made a wise choice in focusing the narrative on just the beginning of their relationship, and how it got started. There is a short flashback that explains some of her family life back in Poland, and this is great for this text. It is focused enough so that we know about her life, yet not too long so it diverts the attention on the topic. Absolutely, there is interesting material for McLain or another author to run away with, giving details of life in Poland, etc. However, I enjoyed the length. It was a nice short read that I was looking for at this time. I think for someone who doesn't know much about her that this is an excellent introduction to spark their curiosity on this incredible woman. I myself want to check out a biography on her. This was a super-short story about Marie Curie before she married Pierre and became the world-renowned scientist we are all familiar with. It begins and ends with her time at the Sorbonne, giving us insight into the many difficulties she endured as a woman in a male-dominated world/field. She just wanted to learn and no man was going to get in her way. It was simple and short. If it were longer I think they could have done a better job. Because the characters were not developed and the plot was rushed. This is a nice little short story about a young Marie Curie on the cusp of her brilliant career and how she met her future husband, Pierre Curie. It does a nice job of describing the colossal challenges that any woman in the late nineteenth century would be up against to succeed in science. Pierre comes across, at times, is a bit too good to be true, but he must've had plenty going for him because he did win her heart in the end and they did become the first couple of science. Also, the story do This is a nice little short story about a young Marie Curie on the cusp of her brilliant career and how she met her future husband, Pierre Curie. It does a nice job of describing the colossal challenges that any woman in the late nineteenth century would be up against to succeed in science. Pierre comes across, at times, is a bit too good to be true, but he must've had plenty going for him because he did win her heart in the end and they did become the first couple of science. Also, the story does a nice job of encapsulating the scientific spirit of the age. Actually, for such a short story there is a remarkable amount packed into it, though it could've been so much more if it had been a bit longer. If Paula McLean was intending to write a story that would be inspiring to young girls than I suspect she accomplished her mission. We need more women in science so I hope many get inspired. Some brief references made here to the dark side of Marie Curry's legacy, a legacy that would eventually cost her her life. Marie Curie always seemed like such an interesting person but this novella or whatever it is (audible freebie) hardly mention her work, just a few footnotes. This is instead a romance, not what I expected. It wasn't horrible but oh so trivial. This is a 1.5 hour (approximately) Audible Original. It was ok. Didn't blow my mind. It's about Madam Curie which I thought could be interesting. Again, it's not bad. I just found it hard to get into. The recording also wouldn't play the last 2 minutes. I'm sure Audible would handle that for me if I called, but I think I'll just move on. I wasn’t expecting this book to be so focused on the romance. I really thought it was going to be more about her life anyway, the only good thing was the narrator. Just a snack of a book. A pamphlet. . .she's really stubborn and then she's not and after that the rest of her life is contained in one sentence. . .I'm not convinced that I shouldn't have really been spending that time on an actual, full biography of Marie. This doesn't work as a summary, and it really doesn't as a teaser either. Rachel Aranda Sorry this novella disappointed you. Hopefully you got it for free. This was one short story about one of the most influential female characters in the history of time. The first lady of science, who was the first to have ever received two different nobel prizes. I love reading about women of strength and this was an outstanding audiobook journey for me. I loved the way she was represented in the story as a strong woman of firm belief and respect for science, who does not give in to the norms and conventions of traditional society. The only problem was that it was so short and I felt like it ended in midway, which was a little disappointing. Interestingly, I compared her to Mileva Maric, (who sacrificed her scientific career for the sake of Einstein) and thought what could have happened if she stood her ground. I guess, we’ll never know. It’s for sure that the taste of this book will linger on my mind for quite some time. In 1893 Paris, the young Marie Sklodowska is studying science at the Sorbonne, a university that has recently begun admitting women. There she will meet other women who aspire to greatness as well as a male student, Pierre Curie. Do not go in to this expecting a sweeping story of Marie finding herself. It is a historical romance novella and too short to get the reader invested in any part of the story or its characters. (I received this Audible Original for free as part of my monthly subscription. In 1893 Paris, the young Marie Sklodowska is studying science at the Sorbonne, a university that has recently begun admitting women. There she will meet other women who aspire to greatness as well as a male student, Pierre Curie. I had read great reviews about this novella, but it is just okay. If it were longer, dealt more with the science and happenings of the time period it could have been better. I knew it was going to be a short book, and I was okay with that. Sometimes the short Audible Originals are a really nice quick read/listen. I have enjoyed most of them; however, this work, as it is, just leaves you feeling unsatisfied and incomplete. Rachel Aranda I admit I would have liked it to have been longer too. Makes me wonder why it wasn’t turned into a full novel. A very cute little fictionalized story about how Marie Curie went to Sorbonne and met Pierre Curie; how she was determined to devote her life to science but was eventually persuaded by Pierre that Romance between them need not mean abandoning science for her. A book about a famous woman told in the first person. Unless the author used Marie Curies diaries she took a lot of artistic license. I felt the story was told by a current day feminist trying to apply 2018 concepts / perspective to the 1890s. Why rewrite history? The past is fascinating enough on its own. I’d rather understand what she was really grappling with as a woman in a mans world. This was offered free off audible. I liked the narrator. Would listen to her again. This audible original about the courtship of Marie and Pierre Curie is very well written, but like most originals leaves the reader wanting more. This Audible Original short story (too short for me to call it a novella) is more telling than showing and focuses on Marie's efforts not to fall in love with Pierre. I love the classic film, Madame Curie (1943), starring Greer Garson and Walter Pidgeon about the discovery of radium. I would favor that movie over this brief story, but I'm not sorry I listened to the audiobook. There were lots of facts about the time period in the book that were interesting.